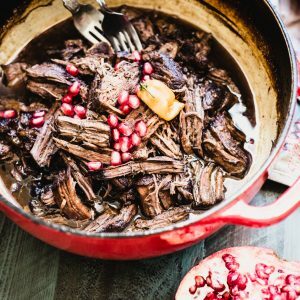 Make the Instant Pot version of my Pomegranate Habanero Shredded Beef. It's gluten-free, paleo, and whole30 friendly...and it's full of flavor and ready in an hour. Add the ghee to the bottom of the Instant Pot insert, and set it to Sauté. Heat the fat until it’s shimmering. Turn off the Sauté function and add the pomegranate juice and habanero pepper. Lock the lid on the Instant Pot. Press the Manual button and set the timer for 60 minutes. When the time is finished, do not quick release the steam. Let the pressure release naturally by waiting at least 15 minutes. If you quick release the steam, the meat will toughen up. Remove the roast to a large plate and shred the meat between two forks. Meanwhile, if you want to reduce the liquid, set the Instant Pot to Sauté once more. Keep the lid off. Allow the liquid to boil until it reduces by about half. Serve on top of the shredded beef. Adjust seasonings with salt and pepper. *Use a jalapeño pepper instead of habanero.